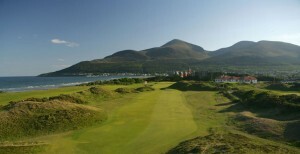 Find out more information about Ireland’s Finest 18 Holes of Golf or any of the courses discussed. If you would like to book a package tour to Ireland then drop us a line at travel@irelandgolf.com or call 00 353 66 71 81708. Come on and play Ireland’s Finest 18 Holes of Golf ! There’s an old Irish adage that states ‘an ounce of breeding is worth a pound of feeding’. In essence it translates to ‘thoroughbreds are born not made’, so pedigree can only be refined it can’t be created. And so it is with golf. Great golf courses, are born from a fusion of natural forces, refined only by the subtle hand of an Arnold Palmer or a Tom Morris. Nowhere has golfing pedigree like Ireland and nowhere can the task of picking a signature 18 be more challenging. And that’s why you want to play Ireland’s Finest 18 Holes of Golf! While our selection displays a penchant for links golf especially in the land of Ballybunion and Lahinch, Portmarnock and Royal County Down. we feel more than justified in our selection. We will soften you up at the start of Ireland’s Finest 18 Holes of Golf. Hole No. 1 (Doonbeg) — As you approach the first on this Greg Norman creation your eyes begin to wander. As you look seaward, one and a half miles of crescent shaped beach acts as a fitting backdrop to the imposing maran grass dunes. The first fairway runs gently from the tee — an accurate drive will set you up for the second which has to avoid some fairway traps before playing into the large green protected on all three sides by monumental dunes. Hole No. 2 (The Cuilin, Tralee) — Wayne Westner once said of Tralee ‘If heaven is not like this, I don’t want to go there.’ The second hole is a dogleg par-5, measuring a full 595 yards and plays directly along the Atlantic Ocean to the right. 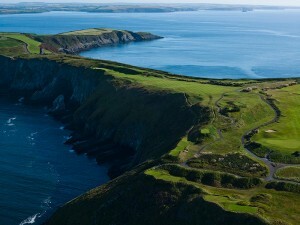 Golfers must negotiate a narrow entry as if by right of passage to the small sheltered green set high upon the cliff top. Hole No. 3 (The Strand, Portsalon) — Described affectionately as eccentric, scenic, old-fashioned and fun this 19th century masterpiece weaves its way majestically along the shores of Lough Swilly. On the third as you approach the green you will need to thread the ball through some ancient rock outcroppings whilst at the same time dealing with the distraction of the panoramic Lough Swilly. Hole No. 4 (Royal County Down) — The fourth hole is set upon a dramatic elevation — from here you have to carry a sea of wild gorse to a well bunkered green – backed by trees and maran grass dunes. The Mountains of Mourne and Dundrum Bay both serve to distract and inspire. a hole of fantastic character – what else would you expect from playing Ireland’s Finest 18 Holes Golf? A short, entirely blind par-3 played over a high dune to a marvellous green. Measuring no more than 30 yards in width and no more than five yards in depth, the green sits snugly into the folds of the surrounding dunes. A white stone on the hill will mark the line of attack. Hole No. 6 (Mount Juliet 13th) — Mount Juliet’s, one of Ireland’s leading parkland courses is also host to one of Ireland’s finest golf holes. A long tee shot opens up the opportunity of a second shot to the green from a gentle downhill lie. The challenge is to take on the lake immediately fronting a fiendishly placed sloping green built atop a granite-faced stone wall, amid a cluster of flowering trees – and why not? This is after all just one hole of Ireland’s Finest 18 Holes of Golf. Hole No. 7 (Swallow Quarry — K-Club , South Course) — Know as Swallow Quarry because of the man-made rock face that has been created rising sixty feet high out of the lake that borders the right hand side of the fairway. Within this rock face, a series of waterfalls and cascades have been constructed to further enhance the beauty of a hole that is likely to add further weight to the suggestion that the 2006 Ryder Cup should move from the North to the South Course. Hole No. 8 (Ballyliffin) ‘The Ballybunion of the North’ — this side-ways complement defines the esteem in which this course is held. The par-3 eighth is perhaps it’s finest. You begin with a tee shot from an elevated tee box, some 150 feet above the green, to a well-protected green surrounded by a lake and many bunkers. among the toughest holes ever devised by Morris. Every shot must be the best you can strike. Heather and gorse are found in natural abundance on the hills of sand, which frame this imposing hole. The approach shot is tantamount to threading a needle, with easily found trouble in the form of hillocks both left and right. Hole No. 10 (Enniscrone) — The 10th, a par-4 and some 338 yards in length is a truly great links hole, a short downhill par-4 that scares and entices, charms and frustrates, all at the same time. A well-placed tee shot leaves just a wedge to a lovely, but tightly guarded green. Hole No. 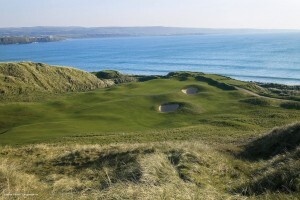 11 (Ballybunion Old) — Beauty, ruggedness and seaside power define this venue and this whole in particular. The 11th is a 446-yard par-4 perched right on the seaside cliffs. Hard by the sea, the green is protected by huge high mounding which blocks a leftward drive. The narrowness of the right hand approach serves as a preamble to the troubles that wait on the green where a pair of sandhills pinch the entry to the raised green. Like the fairway, there are no bunkers to defend the green. None are needed. Hole No. 12 (Mass Hole, Waterville) — >Waterville is a colorful mix of local character and natural beauty. The 12th is perhaps its finest hole, known as the mass hole after a dispute with the local church leaders. After which the green was relocated above the hollow where it now stands, defying golfers to traverse the hollow and hit the green while avoiding the grassy dunes in the back. No. 13 (Druids Glen) — The 461-yard 120-degree dogleg right 13th is universally regarded as one of the best parkland holes in the world. The tee box is enclosed in woods and sits high above a stream that zigzags the entire length of the hole, emptying into a pond that guards the green left. High mounds on both sides tightly frame your drive, in addition, on the right side 200 yards out is granite outcropping 60 feet high. Once you’ve cleared the crossing stream some 40 yards in front of the green with your very long approach shot, you cross over a stone bridge reminiscent of the bridge at the 18th at St. Andrews. Hole No. 14 (Calamity, Royal Portrush) — Perhaps one of Ireland’s most infamous holes, in part because of its name ‘Calamity’ and in part because of the experiences that informed its naming. The par-3 measures 213 yards with a carry over an intimidating gully of 190 yards. Anything to the right of the green drops literally straight down 50 feet. Hole No. 15 (14th at Portmarnock) — Espoused by Henry Cotton as the finest hole in golf, the 14th skirts along Ireland’s Eye as it strikes a blow for the opposing forces of the land into the calm waters of Dublin bay. A dogleg par-4 395 yards — the imposing green side bunkers assuage the adventurous. that juts out from the Irish coastline in to the waiting jaws of the Atlantic. The 17th is believed by many to be the courses finest — a hole where history, nature and the elements fuse to excite and defy in equal measure. A par-5 628 yards — the hole begins all but within the 19th century lighthouse and ends with a black hole downhill approach. In between you will be treated to the sounds of the wild Atlantic beating against the 300-foot cliff face. No. 17 (Sligo) — Sligo, like the county and its people is rugged and rural but equally warm and welcoming. The signature hole is the dogleg left 17th, from a tee box in a valley you position your drive to the first fairway, which is separated, from the second fairway by thick rough and a stream. From there you have a monster second shot to a green at the top of a hill that almost requires a piton to mount. No. 18 (Mahoney’s Point, Killarney) — It is the antithesis of the links course more widely associated with Irish golf – however this course is a must see on any trip. The closing 18th is a charming if not difficult hole. The tight fairway demands accuracy off the tee. The smallish green can be a difficult target as water waits for any ball short right – while the entire performance is played out to the backdrop of Killarney’s stunning lakes and mountains. In choosing Ireland’s Finest 18 Holes of Golf – the best that Ireland has to offer, we were conscious that our selection can never be definitive, such are the intangibles of personal preference and a golf courses evolution. However we have tried to select 18 holes of unnatural beauty that stand as a testament to the landscape and architects who created them. For those who have sampled the courses of golf’s Elysium the debate will rage — but in the end we hope that it will be the memories that prevail. If you would like to find out more on any of the golf courses, or if you want package information, contact us at travel@irelandgolf.com or call 00 353 66 71 81708. 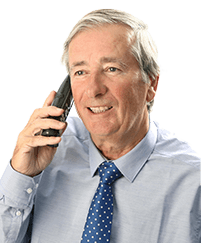 Alternatively, fill out a quotation form and we will get back to you.